Screenshot of Aspen University’s website. One local online for-profit university has raised $6.5 million in new funding. Aspen Group Inc., which runs Denver-based Aspen University, raised the funds earlier this month, according to SEC documents filed Dec. 18. 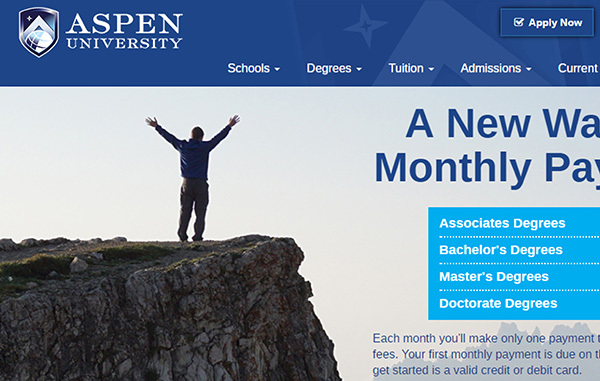 Aspen University offers associates degrees up to doctoral programs, and a monthly payment program for students. At $250 per month, it would take six years to pay off tuition for a bachelor’s degree. The school is located near Colorado Boulevard at 1660 S. Albion St. The company, founded in 1987, had revenue of $6 million in 2016. Several for-profit schools came under fire last year, starting when the Federal Trade Commission sued DeVry University in January for misleading students on job and earning prospects after graduation. Shortly after, Westwood College shut down its schools, including two Colorado locations, citing low enrollment numbers. In 2012 Westwood paid a $4.5 million settlement with the Colorado Attorney General’s Office. The settlement was due to complaints from students that Westwood also mislead students about prospective jobs, as well as credit transfers and tuition costs. In November 2016 Wheat Ridge-based Weston Educational Inc., which ran Heritage College, filed for bankruptcy and closed its campuses. The organization filed Chapter 7 and also was fighting off several lawsuits, including one filed in 2011 claiming a Kansas City campus was falsifying student grades in order to pocket loans. The for-profit school had been running for 30 years.